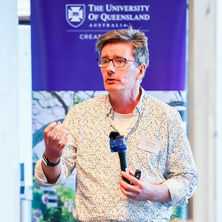 Alex is Professor of Social and Organizational Psychology and Australian Laureate Fellow at the University of Queensland. His research focuses on the study of group and identity processes in organizational, social, and clinical contexts. Together with colleagues, Alex has written and edited 14 books and published over 240 peer-reviewed articles on these topics. His most recent books are The New Psychology of Health: Unlocking the Social Cure (with Catherine Haslam, Jolanda Jetten, Tegan Cruwys and Genvieve Dingle, Routledge, 2018),The New Psychology of Leadership: Identity, Influence and Power (with Stephen Reicher & Michael Platow, Psychology Press, 2011), and Social Psychology: Revisiting the Classic Studies (2nd Ed. with Joanne Smith, Sage, 2017). Alex is a former Chief Editor of the European Journal of Social Psychology and currently Associate Editor of The Leadership Quarterly. In 2005 he won the European Association of Social Psychology’s Kurt Lewin Medal for outstanding scientific contribution; in 2013 he won the International Leadership Association’s Outstanding Leadership Book Award for The New Psychology of Leadership (with Steve Reicher and Michael Platow); in 2016 he won the British Psychology Society Presidents’ Award for distinguished contributions to psychological knowledge; in 2017 he won the International Society for Political Psychology’s Sanford Prize for distinguished contributions to political psychology, and the Australian Psychological Society’s Workplace Excellence Award for Leadership Development (with Nik Steffens & Kim Peters); in 2018 he won the Australian Psychological Society’s Award for Distinguished Contribution to Psychological Science. Examining the contribution of social identity to leadership, motivation, communication, decision-making, negotiation, and productivity. Exploring the role of group processes to the dynamics of intergroup relations and conflict. Looking at the contribution of group life to stress and coping in vulnerable populations. Focusing on issues of research design, ethics, and uncertainty management. Since the 1990s I have collaborated with a number of social identity researchers, notably Steve Reicher, Michael Platow, and John Turner, to develop a social identity analysis of leadership. This work focuses on the role of perceived shared identity as a basis for mutual influence between leaders and followers. It argues that leaders' success hinges on their ability to create, represent, advance and embed a social identity that is shared with those they seek to motivate and inspire. In 2012 the researchers received the University of San Diego – International Leadership Association Outstanding Leadership Book Award for their book The New Psychology of Leadership. I have worked with Michelle Ryan on the leadership experiences of women and together they coined the term "glass cliff" to describe some of their key findings — specifically, evidence that women are more likely than men to be appointed to leadership roles in organisations that are performing poorly. This is now a major focus for research and practice the world over and was short-listed for the Times Higher Education "Research Project of the Year" in 2005. In 2017 the term 'the glass cliff' was short-listed for the Oxford Dictionaries word of the year. My more recent work (funded by both the Canadian Institute for Advanced Research and the Australian Research Council ) has contributed to the development of the Social Identity Approach to health and well-being, also referred to as "The Social Cure"). This work argues that the sense of social identity derived from shared group membership is a basis not only for individuals to have a sense of meaning and purpose in their lives, but also for them to receive and benefit from social support. It is also a basis for them to work together to overcome stressors rather than succumb to them. In 2001 I collaborated with Steve Reicher (University of St Andrews) on the BBC television programme The Experiment, (which became known as the ""BBC Prison Study"). One of the largest and most intensive field studies in psychology in the last 30 years, this examined the behaviour of a group of individuals within a simulated prison environment and re-examined issues raised by the Stanford Prison Experiment (SPE). Amongst other things, the study's findings challenged the role account of tyranny associated with the SPE as well as broader ideas surrounding the "banality of evil". The core insight from the study was that tyranny results from the engaged followership of subordinates rather than blind conformity to roles or rules. Recent work has also demonstrated that the same analysis can explain the behaviour of participants in Milgram's Obedience to Authority experiments, and this idea formed the basis for Kathryn Millard's 2017 award-winning documentary Shock Room. Haslam, S. Alexander, Reicher, Stephen D. and Platow, Michael J. (2015). Leadership: theory and practice. In Mario Mikulincer, Phillip R. Shaver, John F. Dovidio and Jeffry A. Simpson (Ed. ), APA handbook of personality and social psychology (pp. 67-94) Washington, DC, United States: American Psychological Association. Platow, Michael J., Hunter, John A., Haslam, S. Alexander and Reicher, Stephen D. (2015). Reflections on Muzafer Sherif’s legacy in social identity and self-categorization theories. In Ayfer Dost-Gözkan and Doga Sönmez-Keith (Ed. ), Norms, groups, conflict, and social change: Rediscovering Muzafer Sherif's psychology (pp. 275-305) London, United Kingdom: Transaction Publications. Bruckmuller, Susanne, Ryan, Michelle K., Rink, Floor and Haslam, S. Alexander (2014). The glass cliff: examining why women occupy leadership positions in precarious circumstances. In Savita Kumra, Ruth Simpson and Ronald J. Burke (Ed. ), Oxford handbook of gender in organizations (pp. 314-331) New York, United States: Oxford University Press. Haslam, S. Alexander and Smith, Joanne R. (2012). An introduction to classic studies in social psychology. In Joanne R. Smith and S. Alexander Haslam (Ed. ), Social psychology: revisiting the classic studies (pp. 1-10) London, United Kingdom: Sage. Reicher, Stephen D. and Haslam, S. Alexander (2012). Change we can believe in: the role of social identity, cognitive alternatives, and leadership in group mobilization and transformation. In Brady Wagoner, Eric Jensen and Julian A. Oldmeadow (Ed. ), Culture and social change: transforming society through the power of ideas (pp. 53-73) Charlotte, NC, United States: Information Age Publishing. Jones, Janelle M., Jetten, Jolanda, Haslam, S. Alexander and Williams, W. Huw (2012). Deciding to disclose: The importance of disclosure for well-being after acquired brain injury. In Jolanda Jetten, Catherine Haslam and S. Alexander Haslam (Ed. ), The social cure: Identity, health, and well-being (pp. 255-271) Hove, East Sussex, United Kingdom: Psychology Press. Reicher, Stephen and Haslam, S. Alexander (2012). Obedience: revisiting milgram's obedience studies. In Joanne R. Smith and S. Alexander Haslam (Ed. ), Social Psychology: revisiting the classic studies (pp. 106-125) London, United Kingdom: Sage. Reynolds, Katherine J., Haslam, S. Alexander and Turner, John C. (2012). Prejudice, social identity and osical change: resolving the Allportian problematic. In John Dixon and Mark Levine (Ed. ), Beyond the prejudice problematic: extending the social psychology of conflict, inequality and social change (pp. 48-69) New York, NY, United States: Cambridge University Press. Haslam, S. Alexander and Reicher, Stephen (2012). Tyranny: revisiting Zimbardo's Stanford Prison Experiment. In Joanne R. Smith and S. Alexander Haslam (Ed. ), Social psychology: revisiting the classic studies (pp. 126-141) London, United Kingdom: Sage. Ryan, Michelle K., Kulich, Clara, Alexander Haslam, S., Hersby, Mette D. and Atkins, Catherine (2008). Examining gendered experiences beyond the glass ceiling: The precariousness of the glass cliff and the absence of rewards. In Women on Corporate Boards of Directors: International Research and Practice (pp. 165-183) : Edward Elgar Publishing Ltd..
Social identity as the basis of group entitativity: Elaborating the case for the "science of social groups per se"
Haney, Craig, Haslam, Alexander, Reicher, Stephen and Zimbardo, Philip (2018) Dealing with toxic behavior. Psychologist, 31 10: . Haney, Craig, Haslam, Alexander, Reicher, Stephen, Zimbardo, Philip and Wilde, Joanna (2018) Dealing with toxic behaviour. Psychologist, 31 2-3. Reicher, Stephen, Haslam, S. Alexander and Van Bavel, Jay J. (2018) Time to change the story. The Psychologist, 31 8: 2-3. Haslam, Alex (2018) Review of Pain, Pleasure, and the Greater Good Cathy Gere Univ. Chicago Press (2017). Nature, 559 7714: 330-330. Alexander Haslam, S. (2018) Unlocking the social cure. The Psychologist, 31 5: 28-31. Haslam, S. Alexander (2018) Unlocking the social cure. The Psychologist, 31 28-32. Haslam, Alex (2018) War and peace and summer camp: review of The Lost Boys: Inside Muzafer Sherif's Robbers Cave Experiments by Gina Perry, Scribe (2018). Nature, 556 7701: 306-307. Reicher, Steve and Haslam, Alex (2017) Writing for impact. Psychologist, 30 1: 46-48. Our followers are lions, theirs are sheep: how social identity shapes theories about followership and social influence. Haslam, S. Alexander and Reicher, Stephen D. (2016) Leicester's lesson in leadership. Psychologist, 29 6: 446-449. Reicher, Steve and Haslam, Alex (2015) Forum: the Real World. Psychologist, 28 10: 785-785. Platow, Michael J., Haslam, S. Alexander, Reicher, Stephen D. and Steffens, Niklas K. (2015) There is no leadership if no one follows: Why leadership is necessarily a group process. International Coaching Psychology Review, 10 1: 20-37. Haslam, Alex (2015) Disobedient Objects Victoria and Albert Museum. Psychologist, 28 2: 161-161. The neuroscience of inspirational leadership: the importance of collective-oriented language and shared group membership. Reicher, Stephen and Haslam, S. Alexander (2014) Camps, conflict and collectivism. Psychologist, 27 11: 826-828. Reicher, Steve and Haslam, Alex (2014) Forum the real world. Psychologist, 27 1: . Reicher, Steve and Haslam, Alex (2014) Forum the real world. Psychologist, 27 5: . Reicher, Steve and Haslam, Alex (2014) Forumthe real world. Psychologist, 27 4: . Reicher, Steve and Haslam, Alex (2014) Forumthe real world. Psychologist, 27 6: . Reicher, Steve and Haslam, Alex (2013) Forum the real world. Psychologist, 26 10: . Reicher, Steve and Haslam, Alex (2013) Forum: the real world. The Psychologist, 26 9: 620-620. Reicher, Steve and Haslam, Alex (2013) Forumthe real world. Psychologist, 26 5: . Reicher, Steve and Haslam, Alex (2013) Forum: the real world. The Psychologist, 26 2: 80-80. Reicher, Steve and Haslam, Alex (2012) Forum the real world. Psychologist, 25 11: . Reicher, Steve and Haslam, Alex (2012) Forum the real world. Psychologist, 25 7: . Reicher, Steve and Haslam, Alex (2012) Forum the real world. Psychologist, 25 5: . Reicher, Steve and Haslam, Alex (2012) Forumthe real world. Psychologist, 25 3: . Reicher, Steve and Haslam, Alex (2012) Forumthe real world. Psychologist, 25 1: . Reicher, Stephen D. and Haslam, S. Alexander (2011) The shock of the old. Psychologist, 24 9: 650-652.
Cooper, Lisa, Donaldson, Julia, Reicher, Steve and Haslam, Alex (2011) The real world. Psychologist, 24 8: . Reicher, Steve and Haslam, Alex (2010) Forum the real world. Psychologist, 23 5: . Haslam, S. Alexander and Reicher, Stephen D. (2008) Questioning the banality of evil. Psychologist, 21 1: 16-19. Alexander Haslam, S. and Reicher, Stephen (2007) Identity entrepreneurship and the consequences of identity failure: The dynamics of leadership in the BBC prison study. Social Psychology Quarterly, 70 2: 125-147. Reicher, Stephen and Alexander Haslam, S. (2006) Tyranny revisited Groups, psychological well-being and the health of societies. Psychologist, 19 3: 146-150. Haslam, S. Alexander and Parkinson, Brian (2005) Pulling together or pulling apart?. Psychologist, 18 9: 550-552. O'Brien, Anne T., Haslam, S. Alexander, Jetten, Jolanda, Humphrey, Louise, O'Sullivan, Lucy, Postmes, Tom, Eggins, Rachel and Reynolds, Katherine J. (2004) Cynicism and disengagement among devalued employee groups: the need to ASPIRe. Career Development International, 9 1: 28-44. Reicher, Stephen and Haslam, Alex (2002) Ethics and The Experiment . Psychologist, 15 6: . Haslam, S. Alexander and Turner, John C. (1998) Extremism and Deviance: Beyond Taxonomy and Bias. Social Research, 65 2: 434-448. Balaam, Belinda J. and Haslam, S. Alexander (1998) A closer look at the role of social influence in the development of attitudes to eating. Journal of Community and Applied Social Psychology, 8 3: 195-212. Cruwys, T., Haslam, S. A., Fox, N. E. and McMahon, H. (2016). Group Interventions Facilitate Normative Change: Investigating the Mechanism of Action in Eating Disorder Prevention Groups. In: 14th International Congress of Behavioral Medicine (ICBM), Melbourne, Australia, (S78-S78). 7-10 December 2016. Kulich, Clara, Trojanowski, Grzegorz, Ryan, Michelle K., Haslam, S. Alexander and Renneboog, Luc D.R. (2008). Who gets the carrot and who gets the stick? Evidence of gender disparities in executive remuneration. In: , , (). .